Nearly 100 people attended the panel discussion at the Museum of Industrial History in Bethlehem. Nearly 100 developers, real estate brokers, and other professionals from the Lehigh Valley community gathered this week for a discussion about the shortage of the smaller-footprint manufacturing and flex space in the region. The Lehigh Valley Economic Development Corporation (LVEDC) hosted a panel discussion on Nov. 2 to focus the challenges and opportunities presented with the region’s shortage of industrial flex space within the 40,000 to 80,000 square foot range. 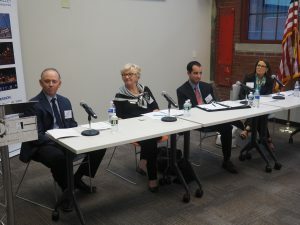 “There’s a lot of tightness in the industrial flex market, and what that translates to is it becomes very difficult to land companies when we can’t find them homes,” Don Cunningham, LVEDC President & CEO, said at the event, which was held at the National Museum of Industrial History in Bethlehem. 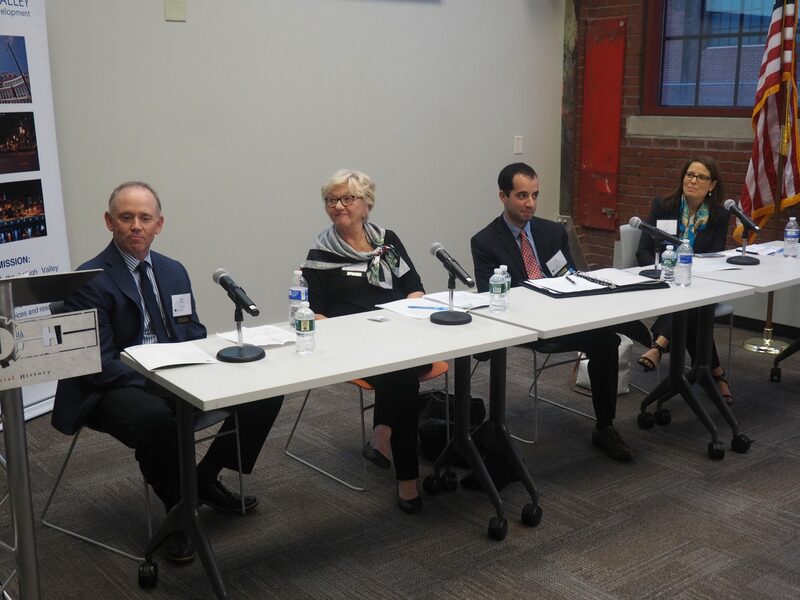 The panelists included Mike Adams, Senior Vice President with NAI Summit; Catherine Bailey, President and COO of Rea.deeming Beauty; Joe Correia, Executive Vice President of J.G. Petrucci, Inc.; and Kimberly Jacobsen, Managing Director of Industrial Services with JLL. Jacobsen said JLL tracks about 125 million square feet of Lehigh Valley industrial buildings in 30,000 square feet range and larger in the Lehigh Valley. In the same market, the buildings that are 100,000 square feet or less total approximately 20 million square feet, and much of it is not up to the modern standards required by today’s tenants. The shortage of smaller-footprint industrial space was also highlighted in the new issue of the quarterly Lehigh Valley Commercial Real Estate Report, which LVEDC released and distributed for the first time at the Nov. 2 event. Adams said the issue can be attributed to economies of scale. Land is expensive, he said, and to build a smaller space and divide it among tenants is more cost-prohibitive than building a much larger building for a single tenant, especially given the growth of the region’s distribution and e-commerce sector. Bailey discussed the challenge from the perspective of a small business. Rea.deeming Beauty has topped the Lehigh Valley Business Fastest Growing Companies list for three straight years, but she said the company still has not been able to grow at the pace that it could because of the challenges of finding space smaller than 100,000 square feet. Jacobsen said it is difficult to build speculative industrial space in this size range because, in addition to zoning and municipal approval challenges, residents often vocally oppose them. She said a possible solution is better marketing to explain what happens in these manufacturing facilities and how they create jobs for the region. Correia said J.G. Petrucci, Inc. is working on smaller-footprint space in places like West Allentown and Hanover Township to address the shortage, and is considering building 40,000 square-foot spaces in the Slate Belt as well. He also lauded efforts like those of the Green Knights Economic Development Corporation, which is seeking to establish a smaller industrial park at the former JH Beers property in Wind Gap. The event was hosted by LVEDC’s Brokers & Developers Council, which is comprised of commercial and industrial real estate brokers, site selectors, developers, bankers, corporate real estate engineers, architects, construction professionals, and those involved in the development and expansion of commercial and industrial business. The Brokers & Developers Council events offer an opportunity to learn about a timely topic and discuss issues affecting those in the industry, followed by time afterwards for networking and further discussion. First Commonwealth Federal Credit Union was the presenting sponsors for this event.